Stephen Schwarzman attends the 2017 NYPL Library Lions Gala on Nov. 6, 2017 at the New York Public Library in New York. Nearly a year before the Abington School District announced a blockbuster $25 million donation from Wall Street billionaire Stephen Schwarzman, school officials quietly took steps to set up a nonprofit foundation to manage the money, records show. The five board members of that group, the Foundation for Abington School District, include only one of the nine school board members voters elected to run the Montgomery County district. Though neither illegal nor unprecedented, the secret agreement and the establishment of a foundation to carry it out have raised larger questions about the influence that deep-pocketed donors could have on public education behind closed doors. Parents hope some answers come Tuesday night, when the school board will hold its first meeting since unveiling with little notice a now-abandoned plan to rename the high school after Schwarzman in exchange for the $25 million. Records show that the money was to be funneled through the Foundation for Abington School District, which was incorporated in March 2017 by a law partner of the district solicitor, Kenneth Roos, according to the state's Bureau for Corporations and Charitable Organizations. School officials have refused to release the terms of the original Schwarzman deal., which the board passed with virtually no community input. Roos stated at the March 27 board meeting that the agreement "is a public record," but district officials now say they need to conduct a "legal review" before releasing it. Parents have been left to speculate about how the money will be handled. "We have a big transparency issue," said Abington parent Andrea Judge, echoing those who have taken to Facebook and other forums to complain about how the district has shielded key information about Schwarzman's gift. School officials say the foundation was started because an existing philanthropy connected to the district — the Abington School District Educational Foundation — was not able to handle such a large amount of money. "What the board and superintendent did is just awful," said Gail Cohen, a 1968 Abington High School graduate who has been following the news from St. Petersburg, Fla. She said Sichel, the highest paid school district superintendent in Pennsylvania, should resign. "I think it's that serious," Cohen said. Sichel, whose salary in 2016-17 was $319,749, ahead of even Philadelphia Superintendent William R. Hite Jr., said the original Schwarzman agreement cannot be made public because of the ongoing legal review. The public will have two weeks to review a pending reworked agreement with Schwarzman, which will be unveiled at the school board meeting at 7:30 p.m. Tuesday. The meeting has been moved to Abington Junior High School to accommodate an anticipated large crowd. "We think we're doing everything we can to right an unanticipated wrong," Sichel said. But some parents say the problem goes beyond the high school name change — nixed by Abington officials after nearly 1,500 people signed a Change.org petition in protest — to the broader issue of giving donors an undisclosed say over their children's education. "Someone coming in with a lot of money can have a whole lot of influence over a public school," said Judge, whose two children attend middle and elementary schools. "If this is something that school districts think they need to do to fund their schools, I think a national conversation needs to happen." When it was first announced, the unusual donation from Schwarzman — the 71-year-old CEO of the Blackstone Group private-equity firm and close friend of President Trump — was promoted as a new model for how public schools can tap into wealthy alumni. For the nearly 8,000-student district, the money would transform its aging high school and create a sparkling new science and technology center. The backlash began after school officials approved the plan on the Tuesday before spring break. The district didn't release details of the agreement until the day it was voted on, and the meeting summary that was emailed to parents the next morning included no mention of renaming the school, which a district spokeswoman says was a "combination of human oversight and unfortunate timing." The action item on the board agenda stated that Schwarzman agreed to make the donation in exchange for renaming the high school after himself, "among other things." 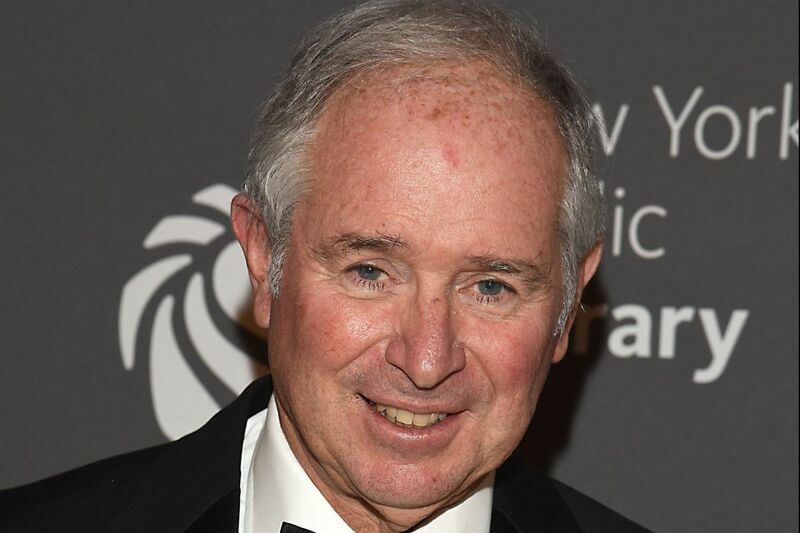 Critics have questioned whether that included requiring new courses in computer coding and other technology, something Schwarzman has publicly endorsed. "Amy [Sichel] and I also agreed that a new curriculum would give students more flexibility to choose classes across a range of subjects and specialties, providing greater exposure to a variety of fields," Schwarzman said in February at the National Conference on Education while discussing the $25 million donation. Sichel said last week that there was no quid pro quo. She said the district had already planned to add technology courses to the seventh- and eighth-grade curriculums. Schwarzman's history of provocative remarks about public education and taxes has added fuel to the fire. Over the last decade, he compared a tax proposal by President Barack Obama to Adolf Hitler's invading Poland. He later apologized. He once said at the World Economic Forum in Davos, Switzerland, that public schools could be made better through unpaid labor, like retirees or "unemployed people that cost nothing, that can have this dramatic difference." He has also praised parochial schools for their ability to fire teachers without union protections. Since 2006, Blackstone Group has been paid more than $300 million in fees and "partnership sharing" from the Public School Employees' Retirement System. The pension system, which covers staff in Abington, Philadelphia, and more than 500 other school districts, is funded by a mix of investment profits, state taxes, local school property taxes, and deductions from school workers' paychecks. "I literally cannot imagine that they didn't realize this would be very problematic, both the way they handled it and the substance," said Gabrielle Sellei, a lawyer and mother of two Abington students. Joseph Rooney, an airline pilot who has twice run unsuccessfully for the school board, filed Right-to-Know requests for the Schwarzman agreement and makeup of the new foundation, and has been rebuffed by the district. The Inquirer and Daily News filed its own records request for the agreement to no avail. "I want to know who gets the money and who controls the Foundation for Abington School District," Rooney said, describing the behavior of school district officials as "shameless." "Their shenanigans are pretty legion," he said. "They operate underneath the radar." Marcus S. Owens, an expert on nonprofits who once headed the tax-exempt division of the IRS, said a new foundation might give Schwarzman greater control over how his money is spent. "A restricted gift to a charity is easier for the donor to control, because there is a fair amount of case law in terms of enforcing donor intent," Owens said. "When the gift is to a governmental entity, it's not so clear that the donor's intent can be so easily enforced." Sichel said: "The donor obviously wants money to go in a 501(c)(3). They don't want it to go into the school district budget because it is a donation." The new foundation is set up as a 501(c)(3) nonprofit. Asked if she regretted the way the rollout of the donation was handled, Sichel said, "Of course. "Who wants a wonderful thing to have a negative associated with it, when it's a most generous gift?" she asked.